I can only conclude that I got Darkside as a present at some point, because I really don't remember picking it up myself. For one thing, the blurb is far too vague to really raise any interest whatsoever. For another, there's something about the cheesy cover obviously aimed at young boys that would normally put me off from picking it up (although I do appreciate that the glow-in-the-dark bits aren't really intended for my demographic). Figured it might still be worth a look since I inexplicably owned it anyway. 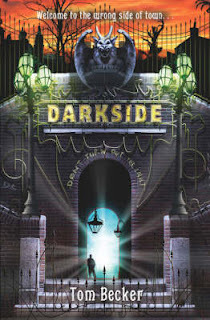 Darkside follows a teenage boy named Jonathan in the wake of one of his father's episodes of catatonia. After resigning himself to another period of waiting for his father to come round to his normal, though only slightly more verbal, self, Jonathan finds that there is something hunting for him and it appears to be connected to his father's illness and his mother's disappearance. To find out what is happening, Jonathan must travel to the Darkside, a secret part of London where Jack the Ripper's descendants reign supreme, and try to find out what's going on before he's taken away or even killed. There was a lot of promising material here. Which makes it really frustrating when I say that Darkside is a completely uneven mess. You have no idea how difficult it was just trying to summarise the novel's premise up there, because by the time you get to the end of the book and look back on the whole thing, you can see plot-holes large enough to drive a truck through and it just comes across as a string of events that just kind of happen because the author says so. For example, the whole being hunted across London thing? Turns out that Jonathan is meant to be part of some weird zoo/gladiatorial pit kind of show. But that stops mattering all that much because when in Darkside, he and his allies find that he's also wanted by one of the most dangerous men in the city for completely different reasons. And that second guy's reasoning for wanting him is also completely ridden with plot-holes: turns out that Jonathan picked up this guy's knife and said assailant wants his property back. Problem is that he dropped the knife in a hospital. Anyone could have picked the sodding thing up, but no, he just somehow knows that it's this specific kid and even knows his name. Why? We never find out! I mean, if you want this kid to be sought after by two separate parties, then just pick the one reason. The gladiatorial zoo thing could have been dropped so easily without having to rework the plot that much, and considering that you have both a secondary protagonist and antagonist tied pretty much solely to that section that's a really worrying lapse in editorial decision-making. Really though, it shouldn't have been there in the first place. All it serves to do is introduce a villain who is vaguely creepy-looking and gets beaten to a pulp in his second appearance, and introduce a protagonist who tags along after being rescued and not really doing much. It could have been so much sleeker, more interesting and less confusing if you just went for "the kid picks up a knife that two or more parties want possession of". It really should not be that difficult. And that's just one point of contention plot-wise. Why does Jonathan insist that he has to find out about his mother from his father, when there are non-comatose people who knew her that he could ask? Why does that one mundane police officer suddenly have a revelation right at the end for no real reason? Does the mental institution not notice that its patients are being picked off one by one, or do they just not care? And another thing. The setting. Darkside could be a really cool place to set a story in. The supernaturally dark underbelly of London that has pretty much stayed in the Victorian era, where it's very much a survival of the most ruthless kind of attitude. Except that there are an extraordinary number of people there with a massive conscience. Carnegie, the lycanthropic private investigator that Jonathan allies himself with, considers himself honour-bound to help this kid he's never seen before because his dad helped him in a tight spot once (not that it's ever elaborated on). Marianne, the bounty hunter hired to kidnap Jonathan, frequently expresses regret that she's paid to kidnap children and keeps one of her henchmen in service because she feels that she is responsible for him after an unnamed accident of some kind. Raquella, the main bad guy's maidservant, helps Jonathan for no real reason at all. Honestly, a setting where Jack the Ripper is the ancestor of their royal family and where time hasn't moved on from the questionable societal norms of Victorian England, I was expecting something quite a lot more brutal. Sure, I get that it's for kids, but these should not come across as nice people. Carnegie, maybe, but the rest? It removes the teeth from what could be a really creepy setting. Finally, just a small thing that pissed me off the whole way through. Carnegie is, as I mentioned above, a lycanthrope, also known as a werewolf. He insists on being referred to as a wereman. For those of you unfamiliar with the etymology of the phrase werewolf, the were in werewolf is an Old English word meaning man. So what is evidently intended to be a clever little spin on old folklore is instead made ridiculous by having the werewolf refer to himself as a man-man. Considering that I learnt that off of a kid's show when I was growing up, my faith in this author's researching ability has plummeted through the floor. Although considering the rest of the novel, maybe we can just assume that my estimation of this writer is currently at a sub-basement level.